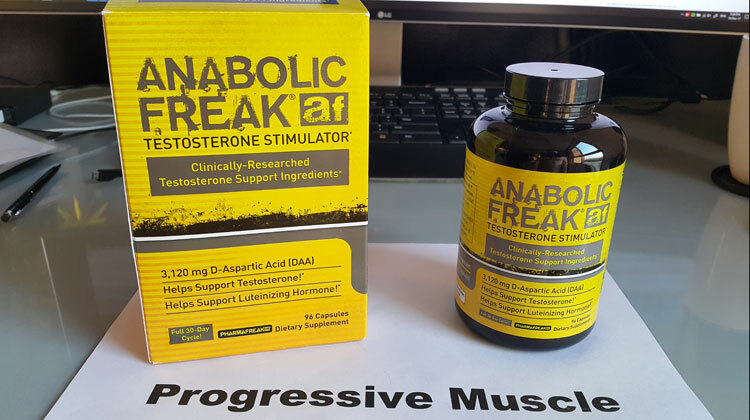 One of the strongest D-Aspartic Acid testosterone boosters on the market, produced by the well-respected supplement company Pharma Freak. Using science backed ingredients, it claims to boost your testosterone levels, giving you increased lean muscle mass. It also includes additional ingredients which supposedly promote healthy cortisol and estrogen levels within your body. 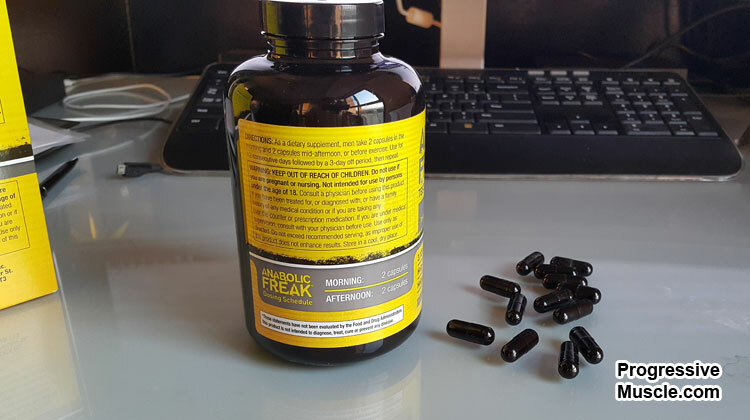 The company PharmaFreak was started in 2008 and has become a very popular sports supplement brand. 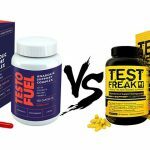 They currently have two test boosters on the market, Test Freak which was released first and then their DAA test booster Anabolic Freak came later. You can also read about their fat burner Ripped Freak which we reviewed in-depth. This is a non-proprietary blend so you can see all the ingredients are clearly listed with the amounts in weight shown. As you can see D-Aspartic Acid is the main component; it’s a strong dose so it is certain to get your test levels raised. It’s great to see vitamin D3 in there but the dosage needs to be much stronger to give you the muscle building benefits. 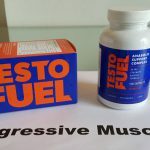 Studies have shown that this powerful amino acid naturally supports increases in your testosterone. It plays an important role in regulating the release and synthesis of the luteinizing hormone (LH) and testosterone in humans. 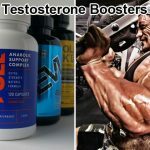 Men who took part in a clinical study showed a 42% increase in testosterone when supplementing with DAA for just 12 days. Research into the ‘sunshine vitamin’ confirm that it plays a critical role in your testosterone production. Lack of exposure to sunlight is common in Western countries during the winter months. This means you will have lower levels of vitamin D and therefore lower test levels. The stated dose is only 400 IU which is simply not enough to make a significant impact. 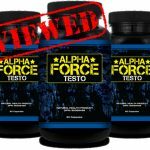 Has been shown to help raise your testosterone levels by stimulating androgen receptors, signalling the testes to produce more testosterone. It has also been found to help suppress the female hormone estrogen allowing your T levels to increase more easily. Estrogen can cause you to have lower muscle mass. Plays a critical role in the production and utilization of energy from dietary fats and proteins when engaged in exercise. It will help enhance your energy levels and prevent fat gains at the same time. This plant compound found in red grapes and berries is known for its anti-aging and antioxidant properties. However it also has a light anti-estrogen aspect which has been shown to help balance and support healthy estrogen levels. Too much of the female hormone estrogen is undesirable when you want to build a muscular male physique. This herb is referred to as an adaptogen; that’s because it helps the body adapt to various different stresses. When you workout in the gym, the hormone cortisol is released which will interfere with muscle building. Rhodiola helps control cortisol and has been shown to support your body’s testosterone to cortisol ratio. It’s recommended that you take 2 capsules in the morning and then another 2 capsules mid-afternoon or before exercise. The cycle is 12 days on and then 3 days off, then repeat. Each bottle provides 96 capsules which is enough for a 30 day cycle. 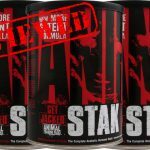 Anabolic Freak has two great ingredients that have been clinically proven to increase testosterone levels, namely DAA and vitamin D.
The strong dosage of D-Aspartic acid giving a whopping 3,120 mg ensuring this test booster will have some effect. Using this product users have confirmed gaining some extra muscle alongside good training & nutrition. 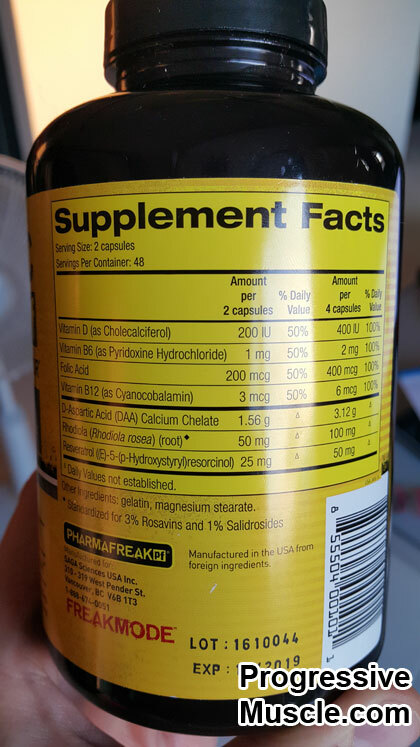 Unlike many sports supplements out there, this one doesn’t use a proprietary blend, so all the ingredients and respective amounts are listed on the label. This means there are no bulking agents, you can clearly see how much of each effective ingredient you are getting. Pharma Freak was originally founded in 2008 by two well respected people in the health and fitness world, Alex Savva and Don Gauvreau. 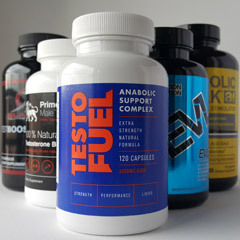 It is now one of the most popular sports supplements companies in the industry today. Customer reviews and feedback of their products are mainly positive. It’s the hot ingredient for muscle building right now with lots of research coming in about its anabolic boosting properties. Unfortunately the stated dose is not nearly enough and while it will have a small effect it won’t give you the the optimal impact that this vitamin is capable of. Although the bottle contains a 30 day cycle there are only enough capsules for 24 consecutive days. There really is no reason for you to cycle off for 3 days when it comes to natural test boosting supplements. Therefore this unnecessarily increases the cost per day of using the product. 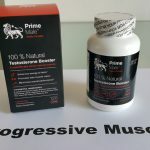 PharmaFreak encourage you to take this product with their other testosterone booster Test Freak to amplify the effect. However this only adds to the overall cost and this one is the more effective of the two so you are better off just taking this one. I would have really liked to have seen them combine all the ingredients into the one product instead. 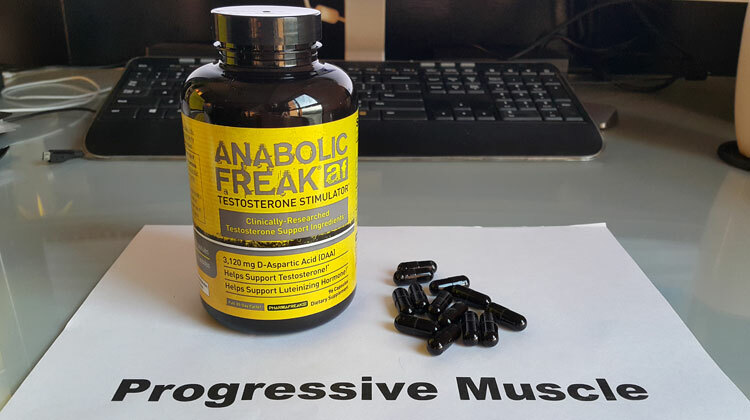 What are people saying about Anabolic Freak? We always like to look at customer reviews and testimonials across the web to get a feel for the feedback on products. As of this time there are no testimonials on PharmFreak’s official website, so we can only really look at customer reviews on retail websites. Scores on Bodybuilding.com and Amazon.com are generally high but with users seeing mixed results. The general feeling is that they expected better results from this product. There have been no reports from customers of any adverse side-effects when using this product and to be fair we wouldn’t expect any either. So Anabolic Freak is a safe when using the recommended dose. There are some reports of stomach upset, which can be avoided if the product is taken with food and only 2 capsules at a time as per the instructions. We really like this booster due to the high amount of D-Aspartic which is sure to get your test levels boosted. The cortisol and estrogen controls are a great addition and will certainly benefit you muscle building goals. Customer reviews and feedback on retail websites are on the whole positive with most users seeing results when using this product. 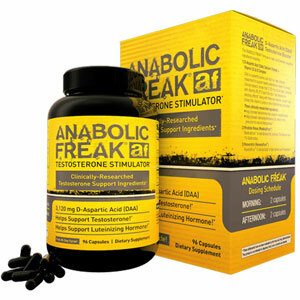 Yes Anabolic Freak really can work and you should see some results while taking this product. But you should be aware that there are better options, with more complete test boosters containing additional effective ingredients. It has however managed to make out top 5 test boosters because it contains proven ingredients and users are seeing results.